Google Maps Custom Driving Directions Description: This 3,613 acre parcel of forest was given wilderness status in 1984. 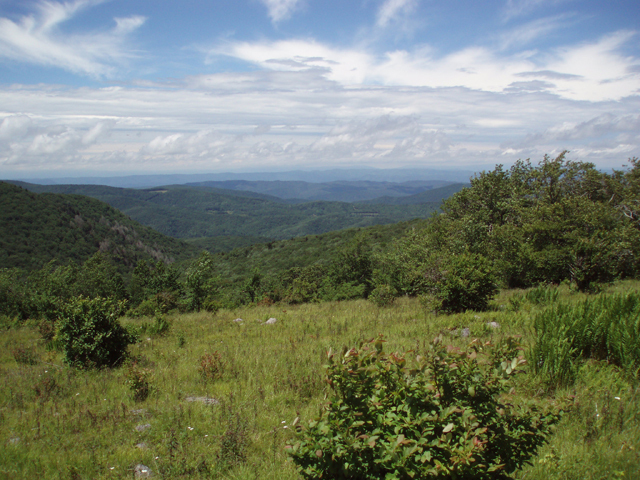 It is a lesser known portion of the Mount Rogers National Recreation Area. This fact alone is a good reason to explore this wilderness. 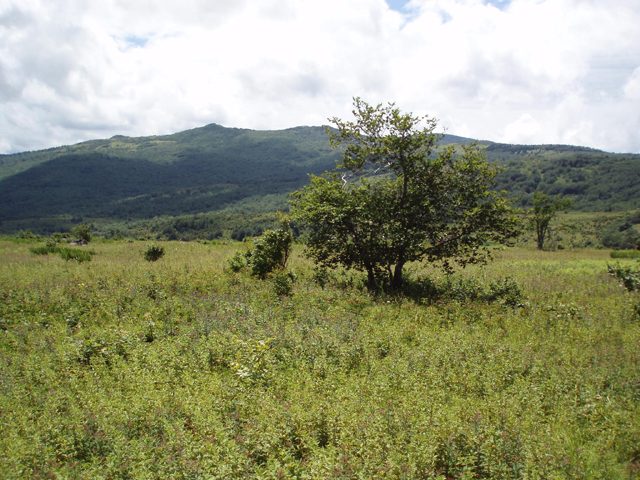 You will gain a greater sense of solitude than what you can obtain in the more popular Grayson Highlands and Mount Rogers. Unlike these the Little Wilson Creek Wilderness is not maintained as open balds but is being allowed to return to forest. 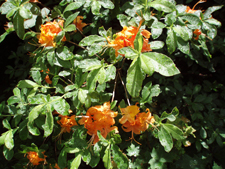 Such being the case it does not have as many open views but the Mountain Laurel and Flaming Azaleas still give way to some nice ones, especially on Second, Third, and what we call Fourth Peak. 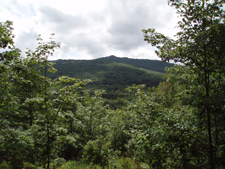 This hike combines some of the wilderness trails with Grayson Highland State Park trails and the AT to form a challenging 12.2 mile loop. 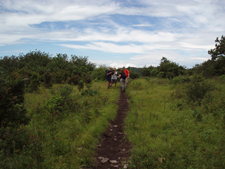 The hike starts at the parking area across the road from the Grayson Highlands S.P. camp store. 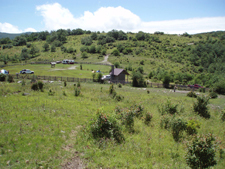 If you are considering doing this as an overnight trip you have to park at the lot near the intersection of the main park road and the campground road and use the orange horse trail and the AT to close the loop. Trail Notes: From the parking area follow the trail down to the kiosk. Follow the red blazed Wilson Trail until you reach dirt Upchurch Rd. Turn right for a few steps but then left to continue on the Wilson Trail. (If you miss this turn the road will eventually switchback down to the next junction.) In 0.2 miles, just before the trail begins to climb turn right onto an extension of Upchurch Rd. There is a nice spot to the left to view Wilson Creek. To the right is a switchback of the road. Bear to the left. 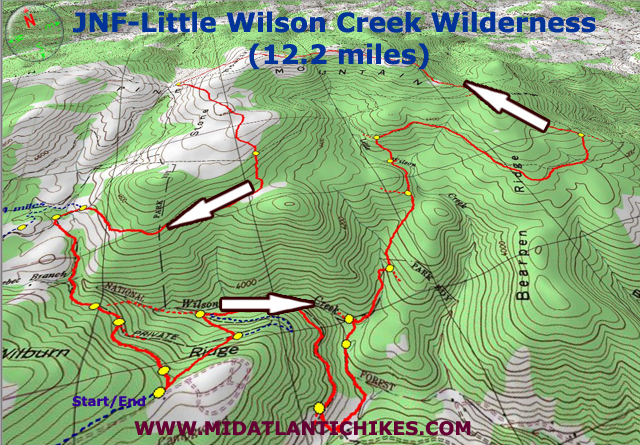 In 0.8 miles bear right onto a footpath, cross an old utility swath and then turn left onto Big Wilson Creek Tr. 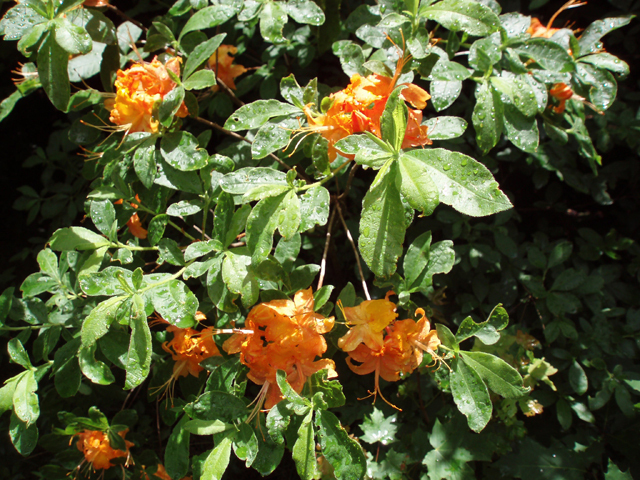 Hike through Hemlocks and Rhododendron tunnels. Cross Wilson Creek in 0.5 miles from leaving the road. There is a small campsite here. 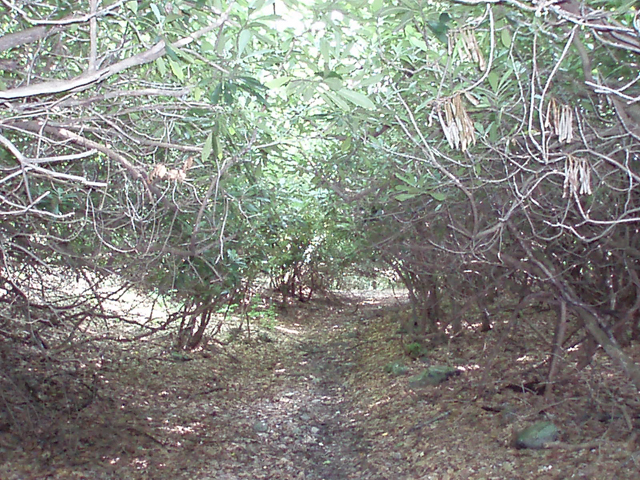 Continue to follow the trail closest to the creek for a few more yards before turning right onto an old woods road. In 0.4 miles turn left at another junction. The trail forks in 0.5 miles. Bear to the right. 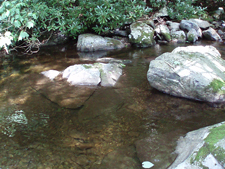 You�ll cross Little Wilson Creek in another 0.4 miles. There is a large grassy campsite here. Turn right onto the Kabel Trail in 0.2 miles. The next 1.6 miles is nearly flat and the tread is in excellent shape. 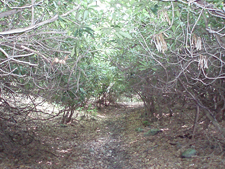 Note that in places the understory is mostly grass, an oddity for a Mid-Atlantic forest. 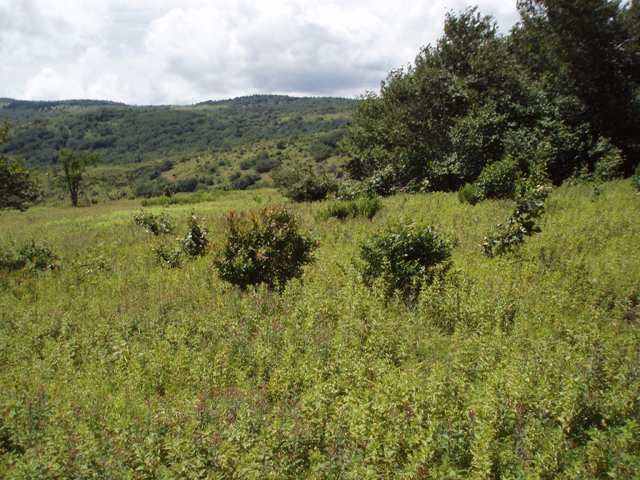 This is evidence that for many years this was probably an open range for livestock. Turn left onto First Peak Trail. 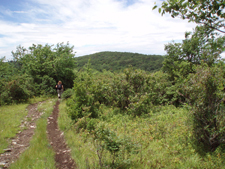 The knob is totally forested with only a large flat rock in the middle of the trail indicating that you crossed the high point. In 0.7 miles from the last trail junction reach a grassy area. Trails go off to both the left and right. Continue straight. In 0.7 miles reach Second Knob. Here you will begin to see views of the Mount Rogers area from a very different perspective. You�ll top Third Knob (even better views) before reaching the junction with Third Peak Trail in another 1.0 miles. You are now outside of the wilderness. Here the views really open up. 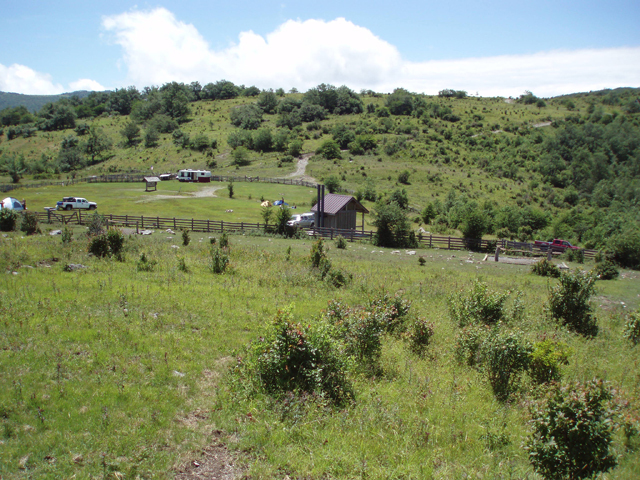 Stay straight and descend on an eroded trail to the Scales, an area where cattle were weighed before taking that long one way ride to the city. You�ll fine latrines, camping and a piped stream here. 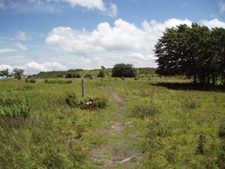 Follow the fence to the south (left) and turn left onto the AT. The trail climbs gradually up the west flank of Stone Mountain through heath and fields of wildflowers. 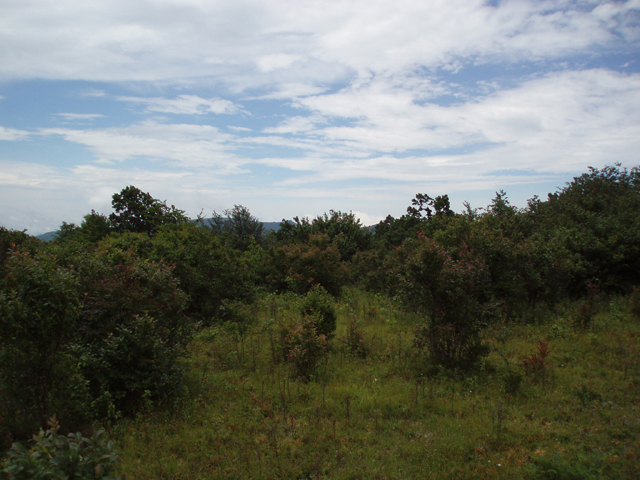 For the next 1.2 miles enjoy panoramic views of the highlands. 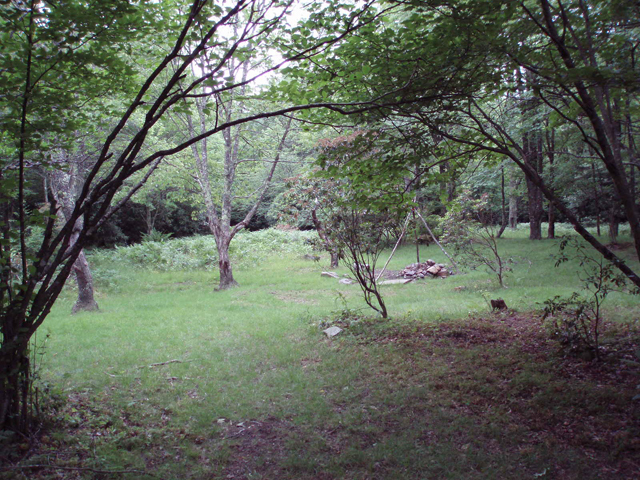 Cross Bear Pen Road and re-enter the woods and the wilderness. You�ll get at least one peak-a-boo view of the twin peaks before crossing Scales Trail in 1.3 miles. Immediately turn left and ford Wilson Creek and a tributary. Join Seed Orchard Road. 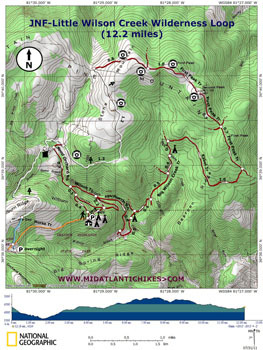 Pass a junction with the Wilson Trail on the left in 0.7 miles. Continue straight. The road soon splits. Bear right. To return to your vehicle bear right at the next fork or continue straight to the road and turn right on the campground road.